Our software creates a 'spatial inventory' of any group of objects; a fusion of map and database. We build tailor-made solutions for Owners and Head Gardeners, enabling them to document and manage plant records and generate accurate mapping for gardens of all sizes. 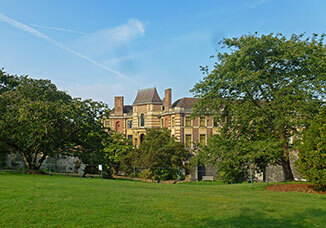 Memorial Gardens and collections with dedications can also be catered for. Collect the data once, use it everywhere - on the desktop, mobile and web. Every garden or collection has different requirements. We look forward to discussing these with you and understanding what resources you might already have that could prove useful. These conversations enable us to propose a range of options and ensure that our software is just right for your requirements. Scroll down to see what you can do and how VantagePoint can help you do it. VantagePoint is the premier, mapping-focused solution, the only one I know. Being able to see where everything is and communicate it to others is an essential part of managing a plant collection. Whether you are one person or part of a team, VantagePoint/Garden will allow you to capture the essence of your botanic collection and secure the future of this valuable data. Capture the knowledge and experience of garden staff for all to use. Extend it with a database that can hold any associated information including imagery, videos, PDFs and links to other databases. Build an archive and record changes to your site. Manage your nursery and accessions, tracking plants and seed from germination to planting out and beyond. Perform complex searches and analysis in both the map and the database. Import any existing electronic records and add them to the database; none of your work will be lost. As with introducing any valuable resource, it will inevitably take some time to bring records into the database and prepare the mapping for your site. It’s a significant undertaking, but one which will pay off for years to come. Good planning means spending more time in the garden and less in front of a computer, as our clients have told us! We can find plants much more quickly so we spend time efficiently, doing the things that matter. Use our differential GPS or your measurements to locate all objects of importance in large and small gardens to high accuracy. Import survey data or conduct trilateration and bearing surveys with built-in tools. Tree inspections and health and safety audits can be handled and special symbols can be used that reflect safety and botanic values. Create a fully editable, layered map that is a precise and visually pleasing representation of your collection. Regularly track changes in the layout of the garden keeping the picture up to date and fresh. Visually realistic and management symbols are scalable to reflect canopy sizes and have seasonal options making the end result much more naturalistic and easy to interpret (and fun!). Label them with accession codes, taxons etc. Label with whichever characteristic you want; name, accession number, Latin name etc, to improve the clarity of your maps, even use more than one characteristic at a time. Working out where something is or how many and where they all are is crucial. Doing this quickly makes life easier. 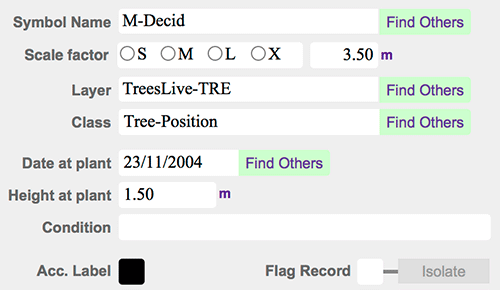 Carry out simple, complex or multiple live searches on attached object data quickly, displaying the results as a visual found set that can be investigated one at a time or as a group. Search results are saved for reuse. Objects on the map can also point to other resources such as saleable items, images, texts and such like that help bind the activities of the institution together, increasing sales potential. Areas and perimeters for all surfaces are always available taking the guesswork out of the management of paths, roads, beds, lawns, rough grass and water features etc. Planning new plantings and works which can be shared with ground staff, designers and architects. Estimate costs of runs of piping and cabling or top dressing quantities to reduce waste. All your data can be shown on the map and is available whether the emphasis is on presentation or functionality. 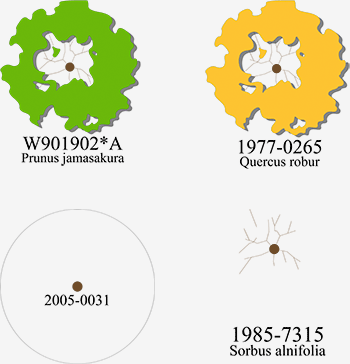 Maintain stock and nursery collection records and a lineage to specimens that are planted out. Track plants from germination to when they leave the nursery. No loss of information – all data is retained and openly accessible for reuse in other environments. Assists in the creation of promotional materials to increase your appeal to your visitors. Creates a consistent “picture” of the garden across different media that reinforces your image. Reduce effort by removing the need to redraw the map for new uses. Publication quality output, suitable for use on websites and in print to generate interest and spread the word. Active web search module allows your visitors to see the location of specimens that interest them on their browser. The printed map is as up to date as the data you hold. Easily understood by visitors when inessential detail is hidden. Discuss your current processes and assess your needs and ideals. Consider how the project is phased. Our charges are based on the outcome of this interaction and reflects what you and we agree is a suitable and practical solution for your site. Gather your data and plan for additional survey. Plan the migration of data and their formats. Locate and manage irrigation and sewerage systems, electrical and communications utilities. Visualise potential dangers. Draw and populate the map. Import GPS survey, OS mapping and georeferenced data directly into the map and attach custom data to every object. Layer aerial photography and map objects with any level of transparency. Deploy the map & database to manage the collection. 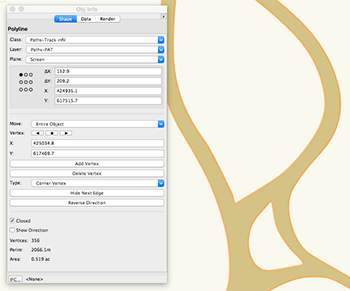 Place new specimens on the map yourself with VantagePoint/Garden's built-in tools. Bearing and trilateration surveys with VantagePoint/Garden’s commands to draw new specimens on the map in the measured location. Search for objects carrying dedications and sponsorship records. Expand use of the mapping to new areas - website, marketing. Present the garden to visitors, supporters and specialists with publication-standard output. No need to redraw visitor materials, signage or web graphics. At the National Memorial Arboretum we have designed a front of house facility to enable visitors to search the 60,000 plus records for a particular name, regiment or event and print a map to guide them to the spot. VantagePoint/Garden is the only solution of its kind, combining a map and a database to provide the biggest benefits. 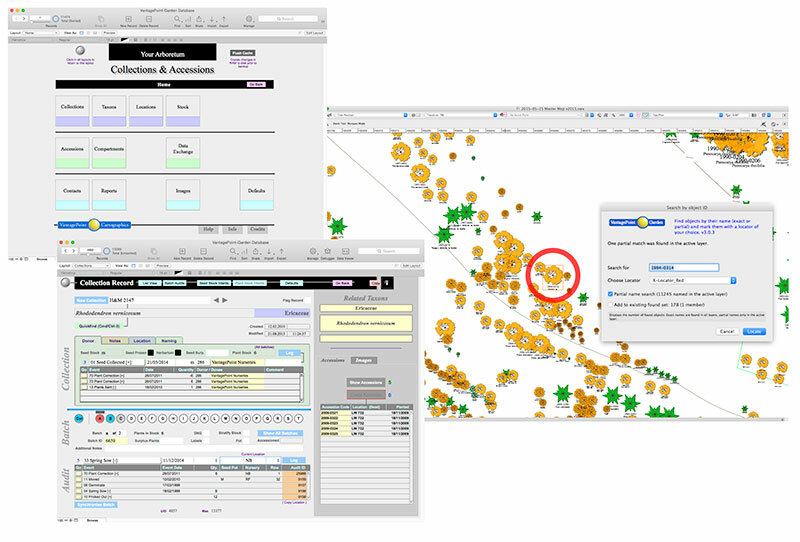 Some tasks need to begin in one and be completed in the other, for example, you might build a complex search in the database and then see the distribution of the plants on the map. Good management of your collection means better efficiency - the Head Gardener at one of our gardens is able to spend 20% more of his time in the garden now that he can plan and record by using a database linked directly to an active map. We enable our clients to capture the wealth of in-house horticultural knowledge accumulated by their staff and specialist researchers alike to improve the management of the site and demonstrate good practice to those funding development. 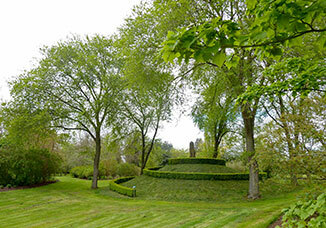 Staff, visitors and investors all benefit from the professional presentation of the garden in print and interactively. It's a tool to make your life easier and check the validity of your collection. It is something which will save you a lot of work. 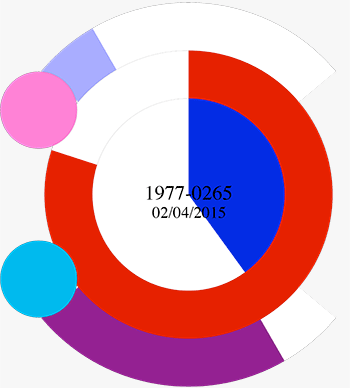 Consistent taxons - accurate and up to date naming drawn from the database. Reduce the need to keep re-entering names from hand-written lists. Know where things are and be able to direct others to them - accurate locations. Searchable - find things quickly with live search with only partial information. Reusable - web and reports - use exported information to create work lists. Your data always remains yours. Security - garden information is held outside the heads of the staff. Stock checking - quicker than paper. Recording and sharing actions - maintain to-do lists visible to all. No copy typing from printed lists, interact with data directly with immediate updates. Reporting events - safety, disease and damage. Attaching images to plant records or any object in the garden with your tablet. Keep up to date with identification and labelling - simplify replacement label ordering. 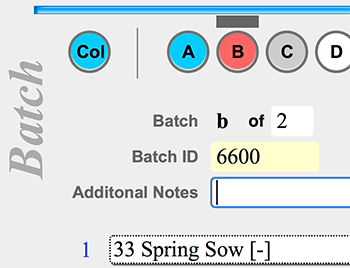 Export data to label engravers for consistent output. Enable others to go there without having to be shown. As a result of our work at the National Memorial Arboretum, we have developed techniques for mapping and identifying arrays of tens of thousands of trees, which would allow us to tackle any similar situations with any kind of object. In conjunction with The National Trust, we have developed VantagePoint/Capture, a set of tools for the extraction of data locked into DXF files that otherwise would have had to be keyed manually. This tool can bring older electronic maps into the present and allow them to become useful once again, saving the costs of resurvey and manual entry. You can use VantagePoint/Garden on your Mac, PC and iPad. There are no proprietary file formats to trap your data. Your data is yours - always accessible and reusable. Joel Sciamma and John Smith are the founding directors of VantagePoint Cartographics Ltd. and we survey, map and catalogue the botanic collections of parks, gardens and arboreta, large and small, across the UK. We have been developing our techniques in conjunction with our clients for over 14 years, to build maps and databases that allow them to visualise and search their collections. In addition to the botanic information associated with trees and other plants, we have handled large datasets for dedications and commemorations, irrigation systems, electrical utilities and tree safety with their information shared between the maps and the databases. Our own databases put a premium on understanding the needs of our individual clients and we take usability seriously. We backup our efforts with high quality documentation, training and support so that our clients can genuinely have ownership of their solutions. We focus sharply on product design and the user experience and ‘support’ is not a euphemism for keeping you at arm’s length from the people who know the answers. The best support is never needing to use it. We have installations that have been running with hard daily use for years without needing attention. We believe that individuals should benefit from the use of technology, not be controlled by it. People still trump computers and VantagePoint embeds these principles in all its manifestations. We continue to develop VantagePoint as we encounter new challenges. If you have a garden or arboretum and feel the time has come to capture the experience of your people and record your collection for all to use, be it for education, research or simply enjoyment, please come and talk to us. If you would like to see VantagePoint in action, we would be happy to visit you and put it through its paces and answer any questions you may have. Screen shots of the databases on desktop and iPad. Obviously identification, location and distribution of everything on the site which is important to you. Making the botanic collection accessible to all staff and to the public. No redrawing - publication standard output for all or part of the site. Reducing reliance on memory and the effects of staff turnover. Planning works of all kinds and designing new features. Experimenting with the design of new plantings. Catalogue all your collections in the nursery. Track plants as they progress from germination from stores, then grown on and planted out. Track the development and maintain a history for all accessions. Record all changes to the botanic collection, from where acquired or to whom donated. Maintain dedications and commemorations for any object. Keep records on statuary, equipment, and other garden features. Find, list and categorise your data in any way that is helpful, instantly. Communicates directly with the map so they can exchange information, plot specimens or capture locations. Save reports and spreadsheets for use with other processes and systems. Share information with other gardens and institutions. VantagePoint is comprehensive but accessible, and the software is easy to use, even for someone with a ‘normal’ level of IT experience. 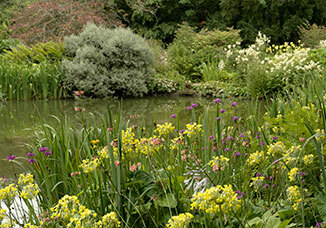 The concept of VantagePoint/Garden arose from work that Joel Sciamma of Inventors Emporium was involved with for Major William Spowers and his arboretum at Windlesham, Surrey. Whilst creating a digital map based on the CAD application Vectorwork™, the point had been reached where accurate mapping of various features became essential. An introduction to John Smith of Mosaic Mapping resulted in the use of differential GPS survey to accomplish this. From discussions bringing together their diverse skills of computer coding and field survey various software tools were designed. 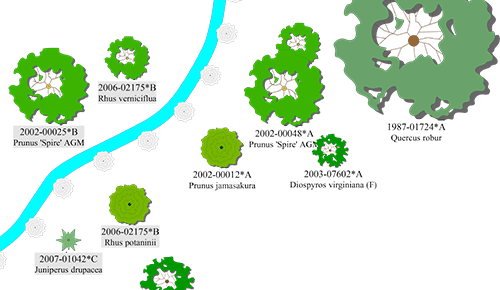 The purpose of these was to enhance and refine the way in which survey data could be used in the production of a visually satisfying and information-rich map of the arboretum. 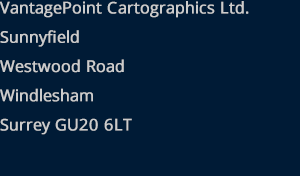 Realising that these techniques would have value to others, and that generally, digitally produced maps were very much poorer from the visual perspective, the software and processes were brought together in a product to be called VantagePoint/Garden. 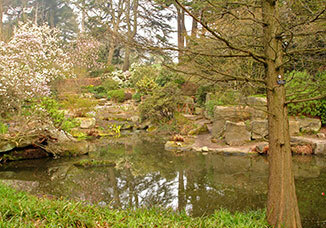 During that period, Mosaic Mapping were undertaking extensive survey at the RHS garden at Wisley. Recognition by the RHS of the potential of VantagePoint/Garden to perform roles in both mapping and graphics lead to the purchase of licences for each of their four gardens. Meanwhile, the Birmingham Botanic Gardens acquired Vectorworks™ and now, with the digitisation of existing data complete, are moving to implementing fully the functionality of VantagePoint/Garden. Following a presentation of VantagePoint/Garden at the PlantNetwork Conference at Kew, Thenford Garden began commissioning survey and digitisation work, contracting ourselves to produce maps with VantagePoint/Garden for publication in visitor leaflets. 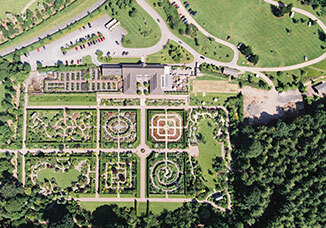 In 2011 this was expanded to a far more comprehensive project to survey, map and catalogue the whole arboretum. A further PlantNetwork Conference allowed recent advances within the VantagePoint/Garden solution to be demonstrated including the direct linking from an object on a VantagePoint/Garden map to a database and back. 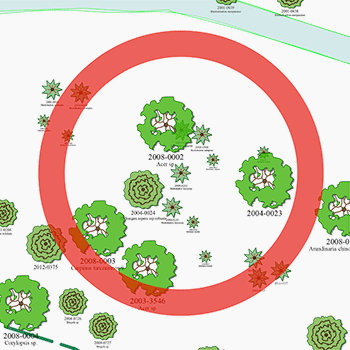 In-house development by the RHS allowed linking of their BG Base database to the VantagePoint/Garden map with a bidirectional flow of data between the two. A seminar, held at Wisley focusing on the methods used to capture data and update their VantagePoint/Garden map, also gave an opportunity to demonstrate a new tool that links map objects to locations displayed in Google Earth. 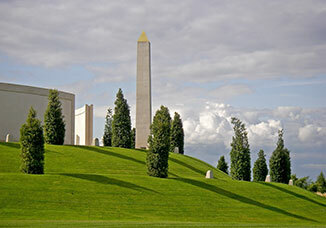 In 2008, The National Memorial Arboretum commissioned survey and digitisation with the provision of a custom database in concert with the implementation of a VantagePoint/Garden solution for their mapping requirements. 64,000 trees were plotted and recorded. 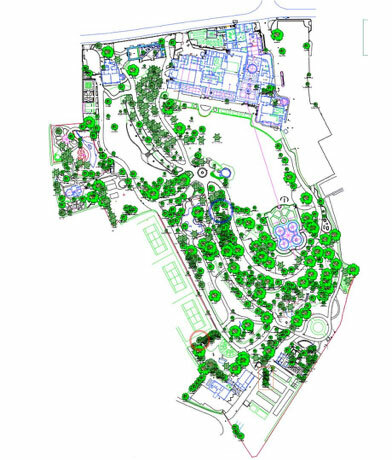 Whilst undertaking a survey of trees at the National Trust’s Tyntesfield Estate, it became apparent that whilst a great deal of information was held within CAD drawings, it was inaccessible for analysis. This prompted development of a suite of VantagePoint/Garden tools designed to locate and extract this information. This enabled us to extract data on thousands of trees, for which the only other option would have been to manually key them in. We have recently introduced the VantagePoint/Go solution for the iPad so that the most modest garden can take advantage of the benefits of accurate mapping and inventories. The use of mobile devices with VantagePoint will be an increasing focus. If you use the contact forms on this website we will use the information you provide to contact you in relation to your questions or comments. The information you provide will not be shared with anyone else unless you explicitly give us permission to, or unless we are required to do so by law. We use this cookie to help us understand how visitors use our website. This information is completely anonymous and is used to help us monitor and to decide how to improve our website. We use these cookies to help us understand how visitors use our website. This information is completely anonymous and is used to help us monitor and to decide how to improve our website. A small notice about cookies is displayed when you first visit this website. This cookie is set if you click the "okay" button so that the notice is not displayed for subsequent visits. If you do not want us to set any further cookies you can decline cookies in your browser settings. Please note that this may prevent some websites from working properly. The content of this website is provided for your general information and use and is subject to change without notice. Your use of any information or materials on this website is entirely at your own risk, for which we shall not be liable. It shall be your own responsibility to ensure that any products, services or information available through this website meet your specific requirements. Whilst we have taken care to ensure the information on this website is accurate and up to date, we shall not be liable for any loss or damage incurred by reliance placed on the information contained in this website or through error or omission. You may only copy, download and reproduce the content of this website for your own personal use. You must not reproduce the content on any other website or for any commercial purpose unless you first obtain our written consent. We cannot guarantee that this website will always be accessible and we shall not be liable for any interruption or delay you experience for any reason when trying to access this website. Your use of this website and any dispute arising out of your use of this website is subject to the laws of England.